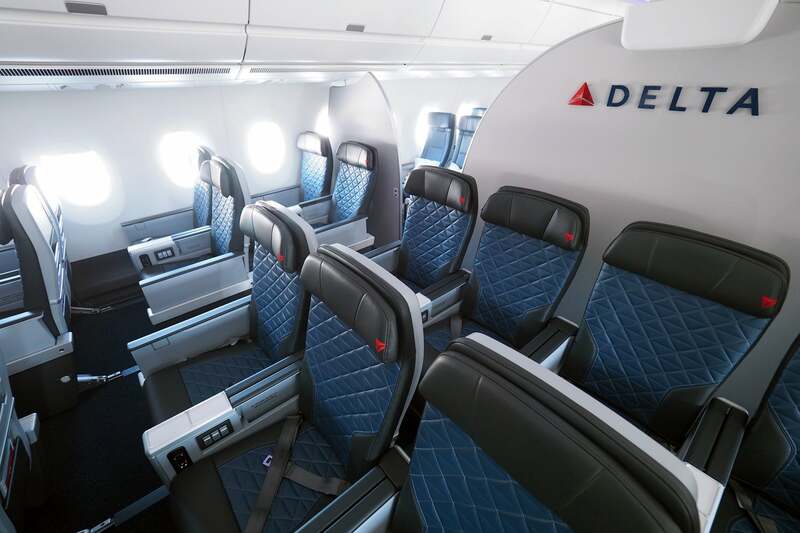 Delta’s long-haul fleet is getting a major upgrade, with the Airbus A350 launching on a handful of flights out of Detroit (DTW). 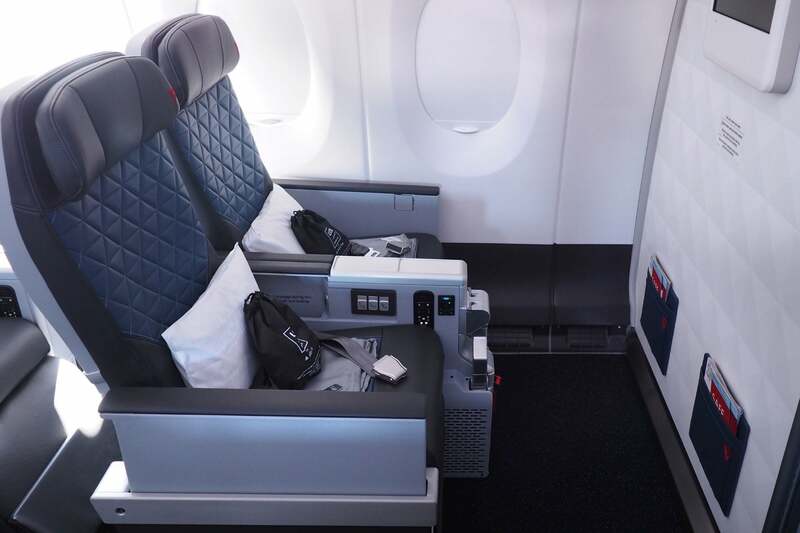 This particular aircraft is the first to offer two of the airline’s latest products: Delta One Suites, with sliding doors at every business-class seat, and Premium Select, Delta’s first true premium economy. The A350, and Premium Select, will fly paying passengers for the very first time on October 30, 2017, on Delta’s nonstop flight from Detroit to Tokyo (NRT). This new flagship plane replaces the soon-to-be-retired 747-400s, offering a total of 306 seats, compared to 376 on the 747. The Premium Select cabin, the focus of today’s post, sports 48 seats arranged in a fairly dense 2-4-2 configuration. Each seat offers 18.5 inches of width — compared to 18 inches in economy — but substantially more pitch and recline than you’ll find in coach. Before I dig into the cabin arrangement, I recommend taking a look at this video tour, which offers an overview of the space and amenities. As I mentioned, seats are arranged in a 2-4-2 configuration, compared to 3-3-3 in economy — naturally, the paired seats are ideal for couples, while the quads will appeal most to families with younger children. While Premium Select seats will measure 19 inches wide on the retrofitted 777s, they’re a bit narrower on the A350, at 18.5 inches. You’ll also get at least 38 inches of pitch — with more in the bulkhead row. 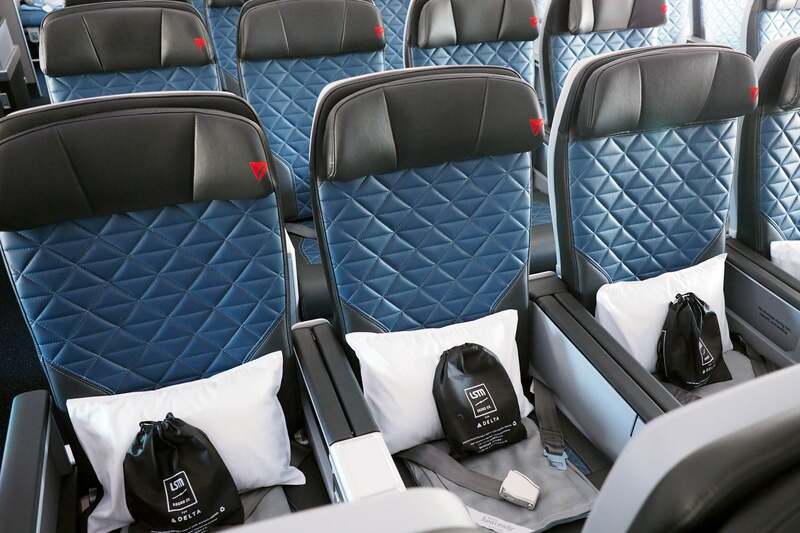 There are six rows of Premium Select seats, from 20 through 25, with 20 positioned just behind the bulkhead wall separating the cabin from the galley and lavatories. There’s a fair amount of space between that row and the hustle and bustle a few feet ahead, and these seats have much more legroom, so generally row 20 would be my preference — unless your priority is to minimize noise and light at any cost during the flight. 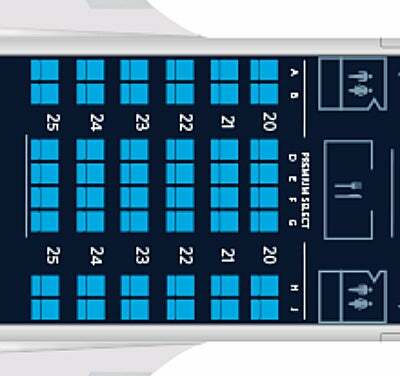 In the bulkhead row, the paired seats are 20A and B, and 20H and J. Assuming those seats are taken, I might opt for the center aisle seats next, starting with row 20 — D and G, in this case. Depending on how tall you are, I might actually recommend a non-bulkhead seat, instead. I’m 5’9″ and felt comfortable in row 25, although I only had a chance to sit there for a few minutes. The non-bulkhead seats offer a bit more storage and a larger in-flight entertainment screen, at 13.3 inches compared to 12 inches up front. There are 12 seats that I’d avoid at all costs — the “E” and “F” middle seats in all six rows. Also note that seats in row 25 don’t seem to recline quite as far, since there’s a wall just behind. Naturally, middle seats feel more cramped, and it’s very difficult to get in and out of these seats without disturbing your neighbor, unless you’re in the bulkhead row. Aside from these 12 middle seats, there aren’t any that I’d go out of my way to avoid, although seats near the back of the cabin should offer a more pleasant experience overall, since you’ll be a good distance from the galley and lavatories. 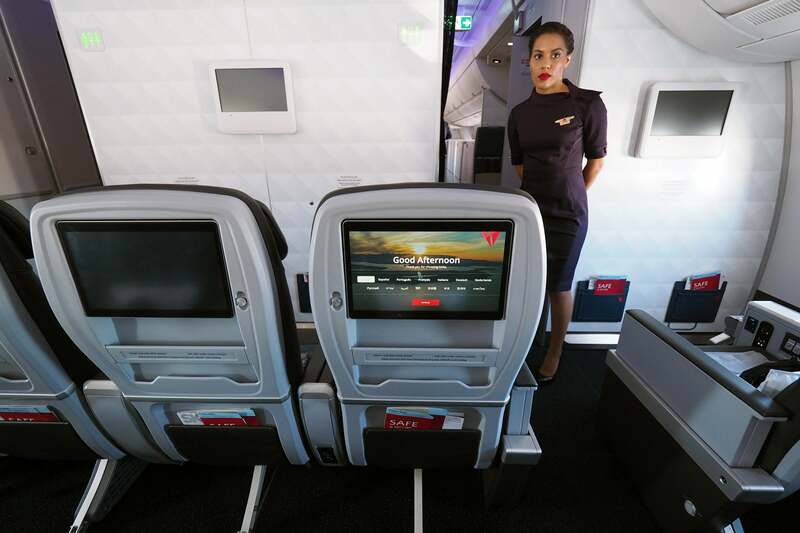 Initially, Delta’s new premium economy is only available on the Airbus A350, the airline’s new flagship plane. Beginning next year, it will gradually roll out to retrofitted Boeing 777s, but the A350’s the only place you’ll find it for now. Delta plans to add a total of 25 A350s to its fleet, so we’ll certainly see the plane added to more routes. I wouldn’t expect further announcements in 2017, though. 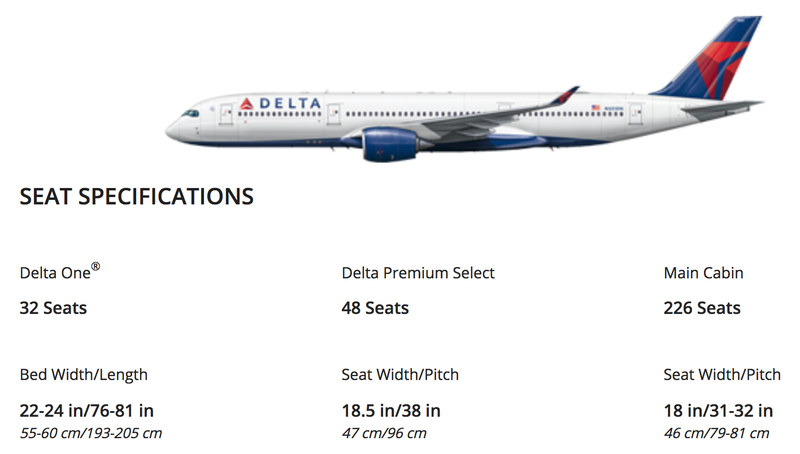 Overall, I like Delta’s new Premium Select product. 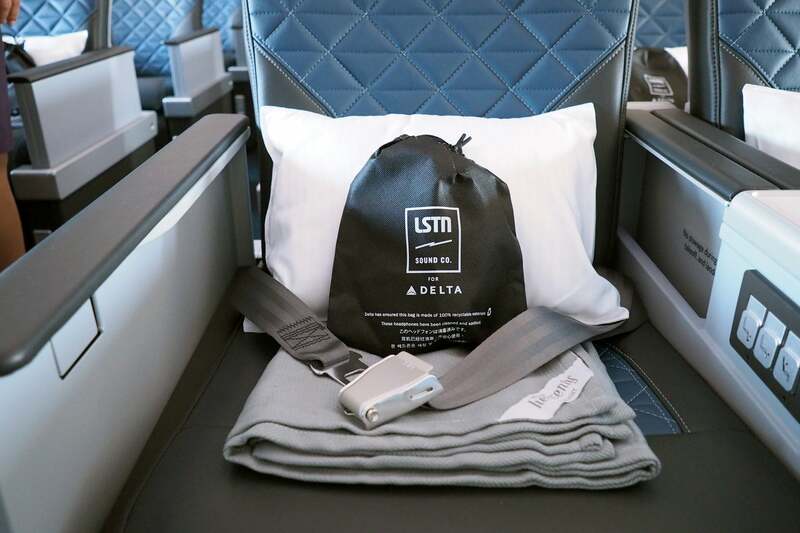 Even though the seats are just 0.5-inch wider than what you’ll find in coach, increased legroom and recline, better service and meals, and amenities like noise-canceling headphones, large pillows and Westin Heavenly blankets make for a clear value proposition over regular economy. 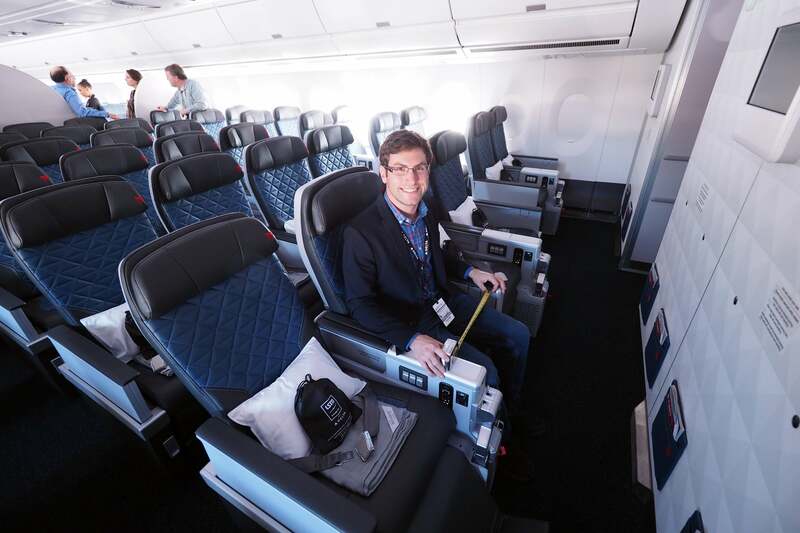 Unfortunately, I only had a few minutes to try it out on Delta’s A350 media flight, but TPG Assistant Editor Nick Ellis is flying the product on the inaugural flight to Japan, so we’ll be sharing a full review very soon.